Since World War II, financial crises have been the result of macroeconomic instability until the fatidic week end of September 15 2008, when Lehman Brothers filed for bankruptcy. The financial system had become the source of its own instability through a combination of greed, lousy underwriting, fake ratings and regulatory negligence. From that date, governments tried to put together a new regulatory framework that would avoid using taxpayer money for bailout of banks. In an uncoordinated effort, they produced a series of vertical regulations that are disconnected from one another. That will not be sufficient to stop finance from being instable and the need for international and horizontal regulation is urgent. This challenge is the focus of Georges Ugeux’s book. The book also contains case studies from real-world scenarios like Lehman, CDS, Greece, the London Whale, and Libor to illustrate the concepts presented. Finance consistently operates within an increasingly global paradigm, and an overarching regulation scheme is becoming more and more necessary for sustainable growth. 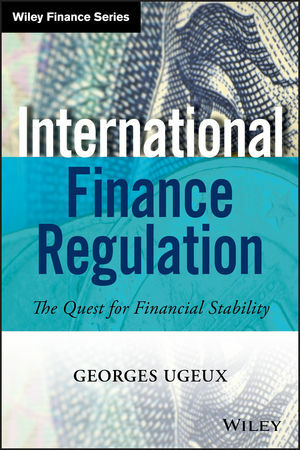 International Finance Regulation: The Quest for Financial Stability presents an argument for collaboration toward a comprehensive global regulation strategy. GEORGES UGEUX, a lawyer and economist by training, is the Chairman and CEO of Galileo Global Advisors. Prior to founding Galileo, Ugeux joined the New York Stock Exchange as Group Executive Vice President, International and Research. He created and ran the New York Stock Exchange's international group in charge of developing the NYSE's reach to non-US companies, including relationships with regulators and governments. Ugeux teaches European Banking and Finance at the Columbia University School of Law and has been publishing, speaking, and blogging on these issues, namely for Le Monde (France) and the Huffington Post.